Commentary on issues concerning Milwaukee, Wisconsin, and the nation. Talgo Inc., the Spanish train manufacturer that recently established operations in Milwaukee, has sent a letter to Milwaukee's corporate spokesmen seeking their assistance in persuading Governor-elect Walker to reverse his decision to return an $810 million federal high speed rail grant. The investment is projected to create 13,700 jobs in Wisconsin. Talgo selected Milwaukee's former Tower Automotive site to house its U.S. manufacturing facility because Wisconsin was the first state to order trains from the firm. The letter asks Tim Sheehy, the Executive Director of the Metropolitan Milwaukee Association of Commerce (MMAC) and Jim Paetsch, who directs corporate relocation for the Milwaukee 7, to speak to the Governor elect on behalf of Talgo and other suppliers related to the project. Don't hold your breath waiting for Mr. Sheehy to help. Not only did Sheehy's organization contribute $381,500 to Walker's gubernatorial campaign , but Sheehy has already said he will not use any chips protecting Talgo's investment in Wisconsin. "Why beat a dead train," Sheehy told the MJS. His focus is on ensuring that Walker cuts taxes. The MMAC and its Executive Director were more than willing to take credit for Talgo when Governor Doyle announced the company was coming to Milwaukee. ""We're Not Just in the Game - We're Winning!" read an announcement from the MMAC. 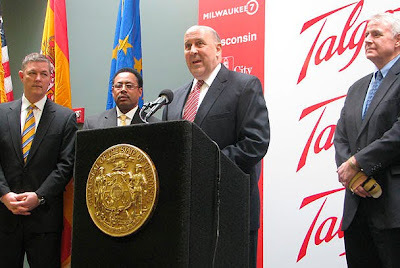 Sheehy bragged that the M-7 was attracting new industries despite some of the gloomiest economic conditions in decades and claimed that Talgo's decision to locate in Milwaukee would help attract additional manufacturing firms to the city. Sheehy, standing to Governor Doyle's far left in the photo above, teased that a third deal with an unnamed firm was in the works. But as recent events demonstrate the the only thing that really matters to Mr. Sheehy and the MMAC is cutting corporate taxes, despite the fact that corporate profits are the highest they have every been and Wisconsin's business taxes are among the nation's lowest. The MMAC's narrow focus on lowering corporate tax rates trumps every other concern including creating 13,700 jobs, securing investment in manufacturing, and revitalizing Milwaukee's central city. Don't hold your breath waiting for Mr. Sheehy to use any chips for Talgo or Milwaukee's unemployed. As long as Walker delivers corporate cut taxes, Sheehy will remain silent. The Washington Post's Peter Whoriskey reports that two-year college enrollments have surged as unemployed and underemployed people seek new skills in an effort to get back to work. But just as workers have turned to two-year colleges, states have cut their budgets, forcing the institutions to turn away legions of students and stymieing efforts to retrain the workforce. The entire article is linked here.
" Admissions representatives at for-profit Everest College were instructed to make prospective students feel hopeless about their lives in an effort to convince them to enroll, according to a court filing by a former employee. In a 13-page declaration filed in a lawsuit against the school's West Valley City campus, the former admissions officer details a recruiting process centered on aggressive, scripted sales pitches. The document was filed this month after the college's California-based parent company, Corinthian Colleges Inc., had the suit transferred into federal court. In the declaration, Shayler White said he worked for Everest College from December 2009 until September 2010, when he was laid off for failing to meet enrollment quotas. He said admissions workers could receive a $5,000 salary bump for enrolling 36 students in six months. They were instructed to use "power words" like "career," "professional" and "successful" to sway potential recruits, White said. White said Everest College would buy "leads," or contact information of potential students, for $80 apiece. He was required to call each new lead three times a day for a week, then once a day for the next month. White made up to 600 phone calls each week. He said his managers told him not to delete the numbers of people who asked not to be contacted anymore. According to White, prospective students who came in for a face-to-face interview were rushed through enrollment paperwork, including the lawsuit waiver the students signed. He said of all the students he signed up in 10 months, only three or four actually read through the agreement. Class war in the U.S.A. The class war that no one wants to talk about continues unabated. Even as millions of out-of-work and otherwise struggling Americans are tightening their belts for the holidays, the nation’s elite are lacing up their dancing shoes and partying like royalty as the millions and billions keep rolling in. Recessions are for the little people, not for the corporate chiefs and the titans of Wall Street who are at the heart of the American aristocracy. They have waged economic warfare against everybody else and are winning big time. The ranks of the poor may be swelling and families forced out of their foreclosed homes may be enduring a nightmarish holiday season, but American companies have just experienced their most profitable quarter ever. As The Times reported this week, U.S. firms earned profits at an annual rate of $1.659 trillion in the third quarter — the highest total since the government began keeping track more than six decades ago. The entire column is linked here.
" As with the collapse of the subprime lending industry, the showdown between for-profit colleges and the government shows how the aspirations of the underserved, when combined with lax regulation, make the rich, richer and the poor, poorer. For-profit colleges provide highcost degree programs that have little chance of leading to high-paying careers, and saddle the most vulnerable students with heavy debt. Instead of providing a solid pathway to the middle class, they pave a path into the subbasement of the American economy." The report by the Education Trust concludes that for-profit colleges deliver “little more than crippling debt,” citing federal data that suggests only 9 percent of the first-time, full-time bachelor’s degree students at the University of Phoenix, the nation’s largest for-profit college, graduate within six years. The report, “Subprime Opportunity,” found that in 2008, only 22 percent of the first-time, full-time bachelor’s degree students at for-profit colleges over all graduate within six years, compared with 55 percent at public institutions and 65 percent at private nonprofit colleges. Among Phoenix’s online students, only 5 percent graduated within six years, and at the campuses in Cleveland and Wichita, Kan., only 4 percent graduated within six years. The Milwaukee campus was only slightly better with an 8% graduation rate. Since the first-time, full-time students tracked in the federal statistics are the most likely to graduate, the report said, these figures may actually overstate the graduation rates. The report concludes;" If there is one thing that the for-profitts can virtually guarantee their students, it’s years and years of student loan debt. In a separate study also released Tuesday, the Pew Research Center reported that almost one-quarter of those who received bachelor’s degrees at for-profit schools in 2008 borrowed more than $40,000, compared with 5 percent at public institutions and 14 percent at not-for-profit colleges. Over all, the Pew report found that students who earned a bachelor’s degree in 2008 borrowed 50 percent more, in inflation-adjusted dollars, than those who graduated in 1996. Those who earned an associate degree or certificate in 2008 borrowed more than twice as much as their 1996 counterparts. The Education Trust is financed partly by the Bill and Melinda Gates Foundation. This month, Melinda Gates resigned from the board of the Washington Post Company, which gets most of its revenues from its for-profit higher-education unit, Kaplan Inc. The entire Education Trust report is linked here. Kaplan Higher Education owns a chain of for-profit colleges like Kaplan University that are under intense scrutiny for misleading students about their future success in order to rake in federal student loans - loans that students often default on. Kaplan Higher Education is also the highly profitable subsidiary of the Washington Post Company which is ever-more reliant on those profits to support its money-losing newspaper. Kaplan has lobbied against the U.S. Department of Education's "gainful employment" regulation that would make programs with a student loan repayment rate of less than 45% ineligible for federal financial aid. Kaplan University's average repayment rate is 28%. The Washington Post has editorialized against the regulation and its Chairman has lobbied against it on Capitol Hill. In the audio below Tamar Lewin of the New York Times explains how Kaplan’s business interests are compromising the Post’s journalistic integrity. Citing the huge economic impact and job creation potential of high speed rail, leaders of the Minnesota AFL-CIO sent an open letter to Wisconsin Governor-elect Scott Walker urging him to reconsider his plans to refuse $810 million federal dollars that Wisconsin had received for this project. The section between Madison and Milwaukee would be part of a larger regional high speed rail system linking Minneapolis/St. Paul and Chicago. In the letter, Minnesota AFL-CIO President Shar Knutson and Secretary-Treasurer Steve Hunter reminded Walker that refusing these funds won’t just hurt Wisconsin, but the entire Midwest.“The larger Midwest high speed rail initiative would put tens of thousands of more people back to work, and make the upper Midwest an even more lucrative place to do business. If Wisconsin says no to this section of the line, it is likely Minnesota will not see any rail dollars in the future,” he wrote. “High speed rail is critical to the economic future of this entire region, and therefore, we are especially grateful for the vocal support of the Minnesota AFL-CIO,” said Wisconsin State AFL-CIO President Phil Neuenfeldt. “This type of action builds the strength of the entire labor movement and brings us one step closer to saving and creating family-supporting union jobs.”The Minnesota AFL-CIO has sent a strong message to Governor-elect Walker, now it is your turn to let him know how badly this region needs quality rail jobs. Click here to sign the Wisconsin State AFL-CIO’s online petition in support of high speed rail. You can also show your support by attending the Candlelight Vigil for Jobs this Tuesday at 5 p.m. outside of the Talgo train facility in Milwaukee. Click here for details about the Candlelight Vigil. “Other areas of the country are clamoring to get their hands on the $810 million dollars in federal funding designated for our rail line,” observes Wisconsin State AFL-CIO Secretary-Treasurer Stephanie Bloomingdale. California, New York, Illinois and North Carolina have all said they would take the money of Governor elect Scott Walker follows through on his promise to reject the investment. “The Midwestern labor movement is adamantly urging Governor-elect Walker to reconsider before it is too late." Local 212 leadership rallied with hundreds of people outside the Talgo Inc. train manufacturing plant on Milwaukee's north side Monday hoping to persuade Gov.-elect Scott Walker to change his mind and endorse the construction of a high-speed rail line through Wisconsin as a way to create jobs and keep the state competitive. Surrounded by supporters chanting "Trains mean jobs!" and "Jobs, jobs, jobs!" leaders from a broad range of organizations, including State Representative and Local 212 member Barbara Toles, stressed the project's importance as a catalyst for redevelopment at the city's former Tower Automotive site and the creation of new jobs, especially in Milwaukee's central city. "Talgo represents a resurrection for many people in this state, and especially in this city," the Rev. Ken Wheeler, pastor of Cross Lutheran Church and Milwaukee Inner-City Congregations Allied for Hope told the crowd. The Spanish firm Talgo moved to the Tower site as part of a plan to build a regional high-speed rail network that connects Milwaukee and Madison to Chicago and Minneapolis, funded with $810 million in federal stimulus dollars. Strayer Education Inc., a chain of for-profit colleges that receives three-quarters of its revenue from U.S. taxpayers, paid Chairman and Chief Executive Officer Robert Silberman $41.9 million last year. That’s 26 times the compensation of the highest-paid president of a traditional university. Top executives at the 15 U.S. publicly traded for-profit colleges, led by Apollo Group Inc. (Phoenix University) and Education Management Corp. (the Arts Institute of Wisconsin), also received $2 billion during the last seven years from the proceeds of selling company stock. At the same time, the industry registered the worst loan-default and four-year-college dropout rates in U.S. higher education. Since 2003, nine for-profit college insiders sold more than $45 million of stock apiece. Peter Sperling, vice chairman of Apollo’s University of Phoenix, the largest for-profit college, collected $574.3 million. Education corporations, which receive as much as 90 percent of their revenue from federal financial-aid programs, are “private enterprise that’s almost entirely publicly funded,” Henry Levin, director of Columbia University’s National Center for the Study of Privatization in Education, said in a telephone interview. While there is a growing movement that bases teacher compensation on student acheivement, for profit college CEO pay has no discernable relationship to student performance. Students at for-profit colleges are defaulting on their loans at three times the rate of those at private, nonprofit institutions, according to data from the U.S. Department of Education, which is tightening regulation of the industry. The graduation rate for first-time, full-time candidates for four- year degrees at for-profit colleges is 22 percent, compared with 55 percent at state colleges and 65 percent at private nonprofit universities. “For-profit colleges are reaching into the public trough to finance luxurious lifestyles at the expense of people who are going to have to pay back loans,” said Levin, a professor at Columbia University’s Teachers College in New York. John G. Sperling, Apollo’s 89-year-old founder and executive chairman, received $263.5 million from stock sales during the last seven years. Robert B. Knutson, retired CEO and chairman of Pittsburgh-based Education Management, the second- largest for-profit college chain by enrollment, got $132.4 million. Dennis Keller and Ronald Taylor, former co-CEOs of DeVry Inc., a Downers Grove, Illinois-based for-profit higher education company, together collected $110.4 million in stock proceeds. For more read the Bloomberg News investigative report, Executives Collect $2 Billion Running U.S. For-Profit Colleges, by John Hechinger and John Lauerman. Nobel prize winning economist Paul Krugman asks how did a deficit-cutting commission become a commission whose first priority is cutting high income tax rates, with deficit reduction literally at the bottom of the list? For his answer, read the column which is linked. A majority of members of the Milwaukee Common Council have signed a letter to U.S. Department of Transportation Secretary Ray LaHood, expressing their continued support for building a Midwest high-speed rail network that would include an extension of the Chicago-Milwaukee Hiawatha service to Madison. We are writing to express our continued support for President Obama’s vision to develop a Midwest High-Speed Rail Network that would initially involve an extension of the Chicago-Milwaukee Hiawatha service to Madison. We continue to believe that this network will improve mobility and provide more travel choices for our constituents and will serve to create wealth and promote economic development in Milwaukee. In addition, our city is in desperate need of the employment opportunities that will be generated by the $810 million federal investment in the development of the Milwaukee-to-Madison extension. Moreover, as you know, this federal investment requires no state or local matching funds. This is a benefit to Wisconsin that is not even afforded under federal highway investments, which require state matches of 20 percent or more. In other words, this investment will not require any expenditure from Wisconsin’s Highway Trust Fund, thereby enabling those resources to remain fully available for Wisconsin highway and bridge work. Our Common Council is on record in support of these rail infrastructure investments. For example, we invested $6.2 million in city funds to renovate and expand the Milwaukee Intermodal Station, and we have invested $6 million in city funds to acquire and renovate an industrial building in Milwaukee for the rail car manufacturer, Talgo, Inc. We overwhelmingly defeated a resolution that would have put the city on record as opposing the renovation of the platform areas of the intermodal station. We have also passed resolutions urging state and federal transportation officials to consider investments in upgraded inter city rail service between Chicago and Milwaukee instead of investing in the expansion of the ISH-94 between Chicago and Milwaukee. In short, we are on board! Ald. Ashanti Hamilton Ald. Nik Kovac Ald. Joe Davis, Sr.
Governor-elect Scott Walker’s ill-advised campaign posture to cancel the high-speed rail project that is already under construction would cost Wisconsin up to 15,000 family supporting jobs and up to $100 million at a time when both jobs and revenue are desperately needed. Walker got a lot of campaign mileage out of this issue as a supposed example of wasteful government spending, but now that he actually will have to govern, cancelling the project at this stage makes absolutely no sense, even if you believe his arguments against the project. Walker’s campaign posturing now threatens thousands of construction and permanent jobs, and will cost Wisconsin much more money to cancel than continue. Given the desperate need for jobs in Wisconsin, and the severe fiscal crisis the state faces, cancelling the high speed rail line amounts to economic treason. Not surprisingly, other governors are already beginning to line up to request the job-creating money for their own states. Governor-elect Andrew Cuomo in New York has already put out a statement asking for the money to create good high-speed rail jobs for New Yorkers. First, let’s review the jobs that will not be created if Walker cancels the high-speed rail project. If it is cancelled, it will cost Wisconsin an estimated 4,732 construction jobs. In addition, research on the economic impact of high-speed rail concludes that when the full project is completed, including the link from Madison to Minneapolis, that 9,570 permanent jobs will be created. Governor-elect Walker has defended cancellation of the high-speed rail project on fiscal grounds, but returning the $810 million in federal funding that is paying for construction of the project would actually cost the state a great deal of money. As the money can only be used for high-speed rail, and the project is already underway, Wisconsin would have to pay back the federal government and contractors for work already done. Policymakers estimate it will cost Wisconsin between $57 million and $100 million to buy out of the project. The maintenance costs Walker railed against in the campaign are substantially lower than this! Walker projected $7.5 million per year during the campaign, but most analysts think it will be much less. If the federal government pays the same percentage of maintenance costs it now pays for the Hiawatha line between Milwaukee and Chicago, the cost to Wisconsin will only by $750,000 per year, which is a tiny fraction of the state transportation budget. In addition, the City of Milwaukee spent $10 million to buy the blighted Milwaukee site where the high speed trains are being built by Spanish manufacturer Talgo, and has invested an additional $6 million to upgrade the facility. Talgo has made it clear that they are unlikely to stay in Milwaukee if the Wisconsin high speed train project is cancelled. As a result, Milwaukee would lose the anchor manufacturing facility needed to spur re-development of the blighted Tower Automotive/A.O. Smith site on the near north side. Given the nearly 15,000 construction and permanent jobs that would be created by the federal investment in Wisconsin in high-speed rail, and the high fiscal cost of cancellation, it would be incredibly short-sighted for Governor elect-Walker to follow through on his campaign posture just to provide more red meat for right-wing talk radio audiences. It amounts to economic treason at a time when everyone, regardless of political and ideological perspective, should be working together to bring desperately needed family supporting jobs back to Wisconsin. An article in today's New York Times explores the pressures on Kaplan University which is under investigation for misleading and exploiting students in several states at the same time that its parent company, The Washington Post Co., is increasingly relying on it for revenue and spending hundreds of thousands of dollars to defeat proposed federal regulation. Kaplan is facing several legal challenges. The Florida attorney general is investigating eight for-profit colleges, including Kaplan, for alleged misrepresentation of financial aid and deceptive practices regarding recruitment, enrollment, accreditation, placement and graduation rates. ...This summer Senator Tom Harkin’s committee, in oversight hearings on the industry, watched undercover videos about high-pressure recruiting tactics that Kaplan and others used to sign up students. Using hidden cameras, investigators from the Government Accountability Office found deception or fraud at 15 for-profit colleges, including two Kaplan campuses. The undercover videos showed Kaplan recruiters in Florida and California making false or questionable statements to prospective students — suggesting for example, that massage therapists earn $100 an hour, and that student loans need not be paid back. ...dozens of current and former Kaplan employees said the videos painted a representative picture. ...Four whistle-blower suits against Kaplan under the federal False Claims Act have been made public in the last few years, all making accusations that the company used deceptive practices in its quest for profits, including enrolling unqualified students and paying recruiters for each student enrolled, a practice forbidden by federal law. In addition, the suits allege, Kaplan kept students on the books after they dropped out, inflated students’ grades and manipulated placement data to continue receiving financial aid. Three of the suits, from Pittsburgh, Milwaukee and Miami, have been consolidated for trial in Miami. A fourth, from Las Vegas, is pending there. But many current and former Kaplan employees and students — including those, like Mr. Wratten, not involved in the lawsuits — said in interviews that they believed the company was concerned most with getting students’ financial aid, and that Kaplan’s fast-growing revenues were based on recruiting students whose chances of succeeding were low. They cite, for example, a training manual used by recruiters in Pittsburgh whose “profile” of Kaplan students listed markers like low self-esteem, reliance on public assistance, being fired, laid off, incarcerated, or physically or mentally abused. Admissions advisers, past and present, say the pressure to recruit students leads to aggressive, and sometimes misleading, sales tactics. Carlos Urquilla-Diaz, a former Kaplan instructor and administrator who is one of the Miami whistle-blowers, recalled a PowerPoint presentation showing African-American women who were raising two children by themselves as the company’s primary target. Such women, Mr. Urquilla-Diaz said, were considered most likely to drop out before completing the program, leaving Kaplan with the aid money and no need to provide more services. “The idea was, we’ll take anybody, and I mean anybody,” he said. Victoria Gatsiopoulos, a former instructor and director of career services at a Kaplan College in Pittsburgh, said in her complaint that the school made promises to students of “how their lives will magically change” if they attended Kaplan classes. Ms. Gatsiopoulos said Kaplan representatives routinely misled prospective students about the jobs they could get after graduation. In reality, Ms. Gatsiopoulos said, graduates would often get the same $8 to $9-an-hour security guard jobs they could have had without Kaplan training. She also charges that Kaplan would raise instructors’ grades for students so they remained eligible for federal aid. Former Kaplan instructors not involved in the litigation made similar claims. Nine years after graduating from high school, Rebecca Masci, a single mother with four young children to support, enrolled in a surgical-technology program in 2004 at Kaplan/CCI in Broomall, Pa., to improve her job prospects. She took out student loans, lined up her parents to baby-sit, and for three terms, excelled in her classes in anatomy, physiology and pharmacology. But to complete the fourth term and graduate, students need a placement to give her hands-on experience in an operating room. She did not get one. Eventually, she said, she was given one short placement, not enough to graduate. Now she has $14,000 of debt, but no surgical-technology certification. “I’m further behind than I was before I started,” she said. David Goodstein, who was the school’s director of education for nine months in 2006, said Ms. Masci’s experience was not uncommon. Mr. Goodstein, who has filed a federal whistle-blower suit against Kaplan, said that although the school had not had enough placement opportunities for the surgical-technology program since 2002, it kept enrolling new students, taking their federal student aid, leaving them stranded without a placement and then dropping them from the program, which was phased out in 2007. Mr. Goodstein’s lawsuit, filed four years ago, is under seal. But the Post Company’s securities filings disclosed an investigation of the program. In the Las Vegas case, Charles Jajdelski, an admissions adviser at Kaplan’s Heritage College, said that while cleaning up after an October 2003, graduation ceremony, he found five boxes of diplomas sitting off to the side. When he asked colleagues about the boxes, his complaint said, they told him they were for phantom students, kept on the books even though they never attended class. The more questions he asked, Mr. Jajdelski said, the more he was told to drop it. Mr. Jajdelski reported the situation to the Education Department hot line in November 2003, his complaint said. He was fired weeks later. Kaplan officials said the company was unaware of Mr. Jajdelski’s accusations until his lawsuit was unsealed in 2008. The other two plaintiffs, Mr. Urquilla-Diaz and Jude Gillespie, have both brought unsuccessful discrimination complaints against Kaplan. Mr. Graham and Mr. Rosen emphasize that Kaplan has made important changes, including its new “Kaplan Commitment,” which allows students to enroll, risk free, for several weeks — thereby eliminating any incentive to recruit unqualified students. During that period, either the student, or Kaplan, could decide that the program was not a good fit, and end the enrollment. Despite the lawsuits and negative attention, Kaplan remains lucrative. The Times said that Kaplan’s revenue in the last quarter was up 9 percent - to $743.3 million -- and that revenue from higher education is four times greater than revenue from test-prep, the company's original service. The Milwaukee Journal Sentinel's editorial board is waging an unrelenting attack on Wisconsin's middle class. While supporting an extension of all of the Bush era tax cuts, including for those making over $250,000, it continues to demand more cuts in Milwaukee County workers' very modest wages and benefits. In a recent editorial the editorial board opinied: Private employees have been required to take pay cuts, furlough days, cuts in their companies' contributions to retirement benefits and have made other sacrifices. They see no reason why public employees shouldn't feel some of the pain. That's one of the messages voters sent Tuesday. Union leaders and county supervisors who fail to recognize that have blinders on. Surely the MJS editorial board knows that County workers are already saddled with 26 furlough days, an avergae salary cut of $5,000 annually. And surely the editorial board knows that more than one thousand middle class County jobs have been eliminated, including 65 layoffs last year, contributing to Milwaukee's soaring poverty rate which the board routinely bemoans. It is gross dishonesty for the MJS editorial board to imply that County employees and other public sector workers haven't made sacrifices because they have. The MJS editorial board has consistently supported demands for employee concessions by firms like Mercury Marine and Harley Davidson without ever exploring whether the firms' financial position requires these concessions. Now that private sector employees have been forced to accept the destruction of their middle class wage and benefit structures that took generations to build, the editorial board is using these concessions to whipsaw public sector employees into even more concessions. But to imply as the editorial did that County workers haven't made concessions is either dishonest journalism or misinformed reporting. Either way, the MJS editorial board is waging a dishonest and one-sided class war against the state's hard working, middle class while urging tax breaks for millionaires. How much do middle class workers need to give up to satisfy the MJS editors? How much of a pay cut is enough? On Friday, Cokie Roberts, senior news analyst at NPR, predicted that Democratic lawmakers, in particular, will be reluctant to aggressively regulate for-profit colleges because of their ties to the Washington Post, one of the nation’s most powerful newspapers. The Washington Post Co. owns Kaplan University, among other for-profits. While the Post maintains the independence of its newsroom, its editorial page has argued against new rules such as the "gainful employment" regulation proposed by the U.S. Department of Education. The gainful employment rule is a quality measure that restricts federal financial aid to those for-profits that have a student repayment rate of 45% or better in an effort to ensure that the education students pay for results in employment with adequate compensation. Currently, many for-profit colleges such as Everest College, do not meet this standard. As a result, students who are frequently paying $20,000 to $70,000 for their educations graduate with debts they have no possibility of repaying. A day after Governor-elect Scott Walker vowed to carry out his campaign promise to kill the Milwaukee to Madison high-speed rail, he called Talgo, the Spanish train company that has set up shop in Milwaukee, asking them to stay. So Walker wants the jobs, but not the product. Walker claims he will use the $810 million in federal stimulus funds on roads, although under the terms of the grants, such a use of the funds is prohibited. Walker's decision is a job killer. The New York Times reports that if Walker follows through on his promise the $810 million and jobs building the high speed railroad will leave the state. So much for making job creation the focus of the new administration. For the entire story read the New York Times article. There were no fireworks Thursday as the U.S. Department of Education hosted the first of two days of public hearings on its much-debated proposed regulatory metrics aimed at defining "gainful employment" for most for-profit-college offerings and certificate programs at nonprofit institutions. The department received more than 90,000 written comments on the proposal this summer and postponed the release of the regulations, which were originally planned for Nov. 1, to allow for more feedback, in the public hearings and in small meetings with stakeholders. The hearings are a rare move for a federal agency in the midst of finalizing regulations but seemed like little more than public policy theater as a string of speakers took the stage for five minutes each in an auditorium at the department's headquarters. In all, 31 pre-approved speakers -- most representing the for-profit sector -- of about 50 who'd been scheduled (some had canceled in advance, others were "no shows," a department spokesman said) shared their views -- extracted largely from their written comments -- on the regulations. Some commenters asked the department to withdraw the rules, but the vast majority acknowledged that the department appears determined to move ahead with the regulations and is more interested in receiving specific, constructive comments than hearing broad denunciations of the proposals. For-profit investors (and, admittedly, reporters) hoped for some hint of the department's current line of thinking on the rules but officials in the room, including Eduardo M. Ochoa, assistant secretary for postsecondary education, asked no questions of the speakers over the course of the hearings. In all, close to 100 people registered to speak on Thursday or today, the second day of hearings. All the institutions, groups and individuals that requested a spot on the agenda were given one, the department said. If, as anticipated, the Republican Party wins control of the United States House of Representatives, federal higher education policy will be radically transformed. 3) The Pell Grant program, which provides low-income students federal grants to pay for higher education will almost certainly experience either direct cuts or be reduced through restricting student eligibility. 4) The effort to regulate for-profit diploma mills will almost certainly be limited to requiring them to disclose costs and graduation and repayment rates. The "gainful employment initiative," a quality control measure designed to tie federal funding to performance, will die. The Inside Higher Education article is linked here.